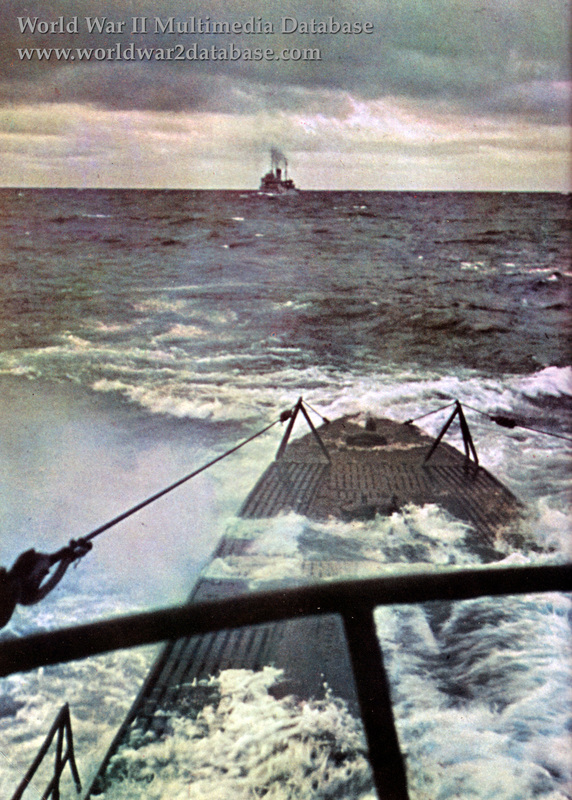 A German minelayer follows a Type IXb U-Boat during a training mission in the Baltic. Type II U-Boats, built between 1934 and 1941, were used to train officers and crew in U-Boats in relatively protected waters. They only served on operational missions during the Polish Campaign in 1939 and the Norwegian Campaign in 1940. Training boats were also newly commissioned combat designs like this one, who would work up crews before entering the Atlantic. During this Baubelehrung (Builder Instruction) period, which could last 11 months at the start of the war, crews would familiarize themselves with the operation of their particular U-Boat. The pressures of war reduced training to two to three months. From 1928 to 1945, officers joined the U-Boats in classes called "crews." Crew 32 was lost before the war when DKM Niobe sank in a storm on July 26, 1932. The last class to captain U-Boats during the war was Crew 42. U-Boat officers and men lost 80% of the men who went to sea during World War II.